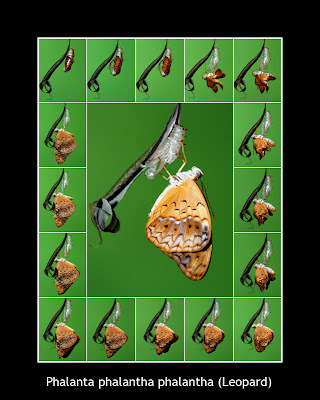 For most butterfly photographers, shooting the sequence of the 'hatching' of an adult butterfly as it emerges from its pupa at the culmination metamorphosis, is something extremely difficult and and requires a lot of patience, but it is nevertheless very rewarding. 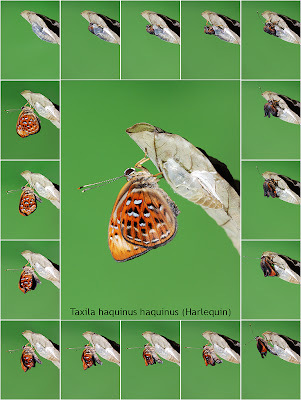 The correct terminology of a butterfly 'hatching' from its pupal case is eclosion*. *Eclosion: The emergence of an adult insect from its pupal case, or the hatching of an insect larva from an egg. From the French éclosion, from éclore, to open. 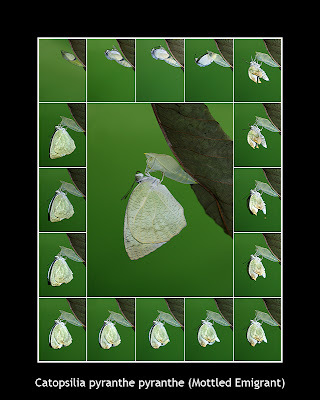 Bobby Mun, a member of ButterflyCircle, demonstrates his skill and immense patience in shooting eclosion sequence shots of a number of butterfly species. Watching the butterfly cracking open its pupal case, climbing out and then pumping "blood" (the correct term for insect "blood" is haemolymph) into its wing veins as the crumpled wings expand into their final shape for flight, is fascinating. The process that traces the transformation of a leaf-munching caterpillar into a pupa which then ecloses into a beautiful nectar-drinking butterfly is one of the wonders of Nature. 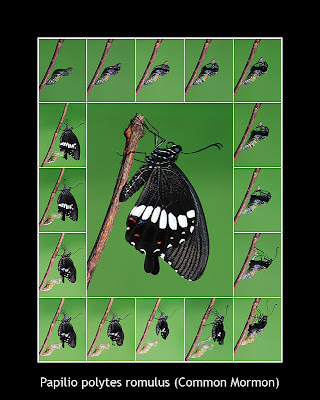 Photographing the eclosion sequence requires a fair bit of understanding of the butterfly's early stages, and preparing the equipment and location for the final shoot. 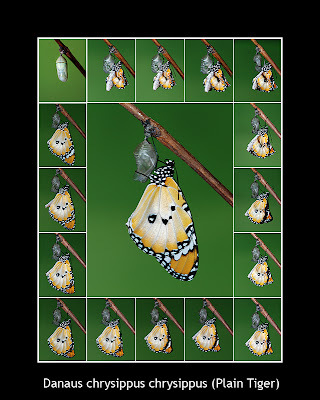 The pupa, which is usually firmly attached to its perch, can be set up against an appropriate background. The photographic equipment need not be anything elaborate, other than the camera, a dedicated macro lens, and a flash unit, all mounted on a tripod for stability. 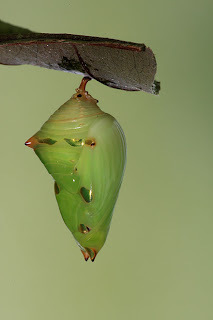 Most species' pupae change colour and appear semi-transparent on the night before eclosion. Very often, the wing patterns are visible through the semi-transparent pupal shell. Butterflies, in general, eclose during the early morning hours, which can range between 5 am to 11 am. There are even some species which eclose in the late afternoon. Hence, an understanding of the biology of the species of butterfly being photographed, would reduce the frustration of waiting in vain for an eclosion which happens the moment you take a lunch break! Once the equipment and the setting is prepared and ready, the photographer requires nothing else but to wait for the eclosion to happen. This is easier said than done, as one would require the "patience of a Saint ; and the luck of the Devil" to succeed with a good series of the eclosion sequence. Typically, the eclosion process takes only 3-5 minutes (for some species, even shorter! 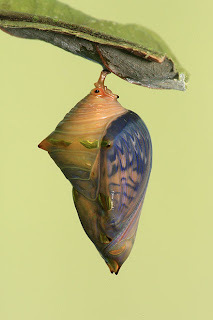 ), from the time the butterfly cracks itself out of the pupal shell and clamber out to hold on to a suitable perch from which it can settle into position to pump its haemolymph to expand its wings. 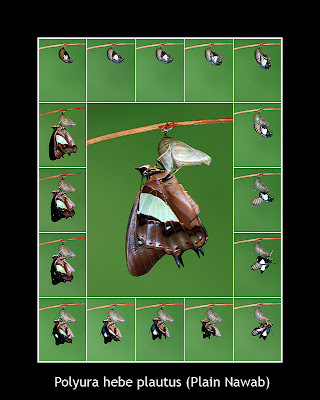 The process of drying its wings before it is ready for its maiden flight can take a couple of hours or more, depending on the prevalent conditions of the location at which the butterfly ecloses.